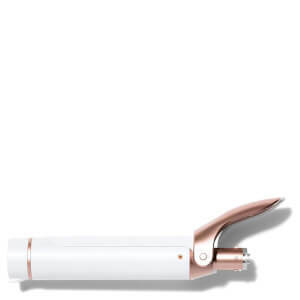 Create covetable curls with the T3 Twirl Convertible Curling Iron; a versatile hair styling tool that helps you achieve salon-worthy locks with a healthy-looking glossy sheen. The innovative styler features T3 SinglePass™ technology, able to control any heat fluctuations for an even and consistent temperature level across the entire barrel, enabling quicker and healthier styling. The Tourmaline and Ceramic coated barrel seals individual cuticles for frizz-free, natural-looking results, with an interchangeable design allowing you to create endless looks with variable shaped T3 barrels (sold separately). Achieve long-lasting waves and curls with minimum damage and maximum staying power. T3 Digital SinglePass™ Technology: Ensures even, consistent heat and fast, healthy styling. 1.25” Tourmaline + Ceramic Clip Barrel: Creates polished curls with coveted shine. Versatile & Customizable: Detachable barrel design allows you to build your own toolkit with other T3 barrels, sold separately. 5 Adjustable Heat Settings (260-410°F / 127-210°C): Provides the optimum heat level for any hair type. Auto World Voltage (100-240V): For use around the world (plug adapter needed). 1 Hour Auto-Off: For worry-free styling. 9ft. 360° Swivel Cord: Prevents cord from getting tangled or twisted. Cool Tip & Stand: Enables easy, secure styling. Heat-Resistant Mat: Protects tabletop and cleans barrel.